There are a variety ways to see and enjoy the Emerald Isle—from the luxury of five-star Dublin hotels, to the myriad of fine B&B’s dotting the countryside, to unique farmhouse vacations where you can enjoy milking cows, gathering eggs, salmon fishing and horseback riding. There could be no better match for visitors to the lovely city of Vancouver than a stay at the Wedgewood Hotel. Stepping into the small, intimate, elegant lobby, with its dark paneled walls, silk oriental rugs, marble floors, antiques and original artwork, I experienced an immediate connection to this refined, European-style, boutique hotel. A pleasant 3-hour drive from D.C. It was 12:30 am and I couldn’t sleep. I was leafing through a Conde Nast magazine trying to take my mind off a prediction for January; a polar vortex. With that and all the other threats converging in a restless world one had to be prepared. The magazine touted enticing and exotic destinations, that promised a complete change of perspective. Turning to a slick page of advertising, I was struck by the image of a woman lying with “sacred stones” lining her body and lavender being poured from a silver salver on her serene forehead. The copy read, “Heal your mind, body and soul in a setting that combines nature’s elements -- earth, wind, fire and water… engrave your soul, spark a rebirth!” The ad was not clear about the location. I told myself that any rebirth I might experience would be ideal if it was close to home and didn't intrude too much on my schedule. So I dialed the 800 number and discovered that the Nemacolin Resort and Spa was located in Farmington, Pennsylvania, just three hours from Washington. Several weeks later, after persuading my husband to take a few days off from international flying, we set out to see if all that magazine hype was anything like the reality. On a brisk December Sunday, just as the sun was setting, we pulled up in front of the grand French style chateau set on 1500 acres in the Laurel Highlands of Pennsylvania. Christmas lights adorned the surrounding trees, and in close proximity to the entrance, an empty Santa’s sleigh awaited its primary navigator. The festivity of the season was in the air. In the lobby stood a gigantic Christmas tree, and nearby a homemade gingerbread house, big enough for a five-year old to enter, and tempting all with its aroma. In fact, one curious little girl was halfway through the front door when her mother grabbed her arm and tried to explain that it was too delicate to play in. The spacious classic décor, with its combination of chandeliers, indoor columns, oriental rugs and fine selection of French Impressionist paintings, exude a relaxed, low-key sophistication and tranquility. A sense of bright spaciousness reigns throughout. Guestrooms have high recessed ceilings and casement windows tastefully adorned with rich, colorful brocade drapes. A huge and steep Jacuzzi was the major attraction of the large marble bathroom. The history of Nemacolin Woodlands began in 1740 when a trail was carved through the rugged Laurel Highlands Mountains by a native Indian chief named Nemacolin, between what is now Cumberland, Maryland and Brownsville, Pennsylvania. Later widened during the French Indian Wars, the historic Fort Necessity was constructed near the trail. In 1968, a private game reserve, hunting lodge and air strip were established. Later came a conference center. In 1987, Nemacolin was sold at auction to Joseph Hardy Sr., founder of 84 Lumber. His dream was to turn Nemacolin into a world class resort. For the next 10 years, parts of the dream were realized each year, including a large and tasteful shopping arcade. On Memorial Day, 1997, the Chateau LaFayette was opened with a grand celebration which included PGA great Tiger Woods. This glorious French renaissance chateau offers 125 luxury guestrooms and suites. Included are the Grand Lobby, Lobby Lounge, the Tea Room, Cigar Bar, Hardy & Hayes Fine Jewelers, and Lautrec, a contemporary French restaurant. Once settled in at Nemacolin, there is no limit to the range of activities available. If you choose to just relax, there are lovely cozy rooms with fireplaces where one could conceivably curl up with a good book. This resort for all seasons offers guests an endless variety of activities. The equestrian center has a variety of one-hour trail rides for beginner and intermediate riders. Sleigh rides on a snowy evening are a perfect way to experience the lovely grounds of Nemacolin. There is bicycling, snow skiing, hiking, and if you want to learn to clay shoot, Nemacolin has its own 140-acre sporting clay course, the largest shooting academy in the country. Many guests are attracted by the 36 holes of championship golf, 18 holes make up Mystic Rock, an award winning Peter Dye masterpiece. Spreading the activities throughout our two-day stay, our first choice, just prior to dinner, was an exhilarating swim in the great Olympic size pool, happily devoid of chlorine. Our timing was perfect -- the entire pool was ours. Later we dined in the Golden Trout restaurant, which has received a RiRoNa award together with a four-diamond rating. The menu is extensive and varied. Feeling adventurous, and having worked up an appetite, I opted for the roasted buffalo. To my amazement, a huge portion arrived at our table, and although it would have sufficed for at least three diners, it was tender and tasty reposing in a wonderful plum gravy. My husband had excellent lamb chops perfectly seasoned and grilled. Desserts were also imaginative, if more delicately presented. The highlight of our visit was the world renowned, million dollar Woodlands Spa. When I walked into the spa I felt like the perfect sampling of a stressed out body three days prior to unspooling. At first I wondered if I could lie still long enough for any treatment. I started with a soothing facial. I then headed downstairs to bask in the “sacred stone” massage. This was as advertised -- contentment, relaxation and balance. With stones bubbling next to me, dim lights above, and the soft sound of flute music intertwined with the sound of the sea, my mind floated back through centuries, seeking the delicacy of a more gentle era. This new concept, from the wisdom of the east, was the epitome of relaxation. Indeed, just as advertised, the toweled wrapped body is lined with small stones made warm in the bubbling water and skillfully used in the massage. Our visit was all too brief, but at Nemacolin we knew we had discovered a setting in which one could enter tightly spun, refresh at the luxurious spa, exercise in the exhilarating mountain air and depart with a sense of relaxed renewal. Nemacolin had become like a nurturing friend to visit in all seasons. To know it stands waiting, a pleasant three-hour drive away, makes it an even more magnetic attraction. For reservations and more information on a variety of special packages call Resort Reservations at 800-422-2736, or visit www.nemacolin.com..
Winding along wintry country roads, through the lovely Allegheny Mountains, the landscape is sparsely populated with small homes, bare trees and rolling fields. We passed through sleepy, Virginia villages with soothing names like Monterey, Millboro Springs, Warm Springs. In the quaint village of Warm Springs, we spot an old, octagonal wooden building with steam rising from its roof. The sign read The Jefferson Baths, named in honor of the author of our Declaration of Independence who in 1818 had traversed the same winding route in a horse and carriage. A quick stop tells us the Baths opened on June 1, 1761. We later discovered that Jefferson set up lodgings at the Homestead, and at age 75 stripped and lowered his arthritic body into the healing mineral waters. The pool is about 120 ft in circumference and holds 40,000 gallons of clear mineral spring water with a natural temperature of 98 degrees. It is considered the oldest spa structure in America. Some five miles after the Jefferson Baths, suddenly, like a mirage in full view of the road, a Georgian-style mountain resort appears. The Homestead looks gigantic---red brick, trimmed in white with a tower centering two huge wing spans spreading east and west. Set on 15,000 spectacular acres of lush, fertile woodlands, even in the heart of winter, its manicured lawns are a showcase surrounded by flower beds waiting to bloom. Looking at this dreamlike setting, so far from the 'real' world, it is uncanny to contemplate that even before Thomas Jefferson, George Washington visited this area several times in 1755-56. He stayed in a much smaller accommodation which became the core of today’s foundation. The first formal Homestead resort was built a decade later in 1766. Since 1766, and for the next 237 years, a long parade of luminaries, including almost every president since George Washington, followed in his footsteps, drawing more visitors to the healing ambience of this unique setting. From the crisp outdoors, we enter the grand vestibule and find a warm, welcoming atmosphere in a row of crackling fireplaces along the great entrance hall. Afternoon tea is being served. 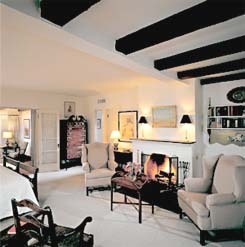 Guests are seated at small tables surrounded by cushioned sofas near the fireplaces. A serene tranquility pervades. Walking the halls of this luxurious setting with its 506 guestrooms, one is struck by the openness and interaction of space and light. Our room, which is really two rooms, a sitting room and bedroom, has high ceilings and five soaring windows overlooking tennis courts and miles of rolling countryside. Through a French door we walk onto a wide terrace where one could pull out a chair and read, or enjoy the sun during warmer months. Walls are decorated with cheerful, uplifting hues---yellow, gold and pink. The bathroom had all the amenities one could wish for, the surprising exception was a hook on the bathroom door and a makeup mirror; a convenience for contact wearers. One corner of the suite was flanked by three windows. Here I found the perfect relaxation nook, where a good book becomes even better---surrounded by beams of sunshine. Dining at the Homestead is a special event. Guests dress for dinner, some women wore floor length skirts and men wore jackets and ties. The ambience of the first evening felt quite formal. From an extensive menu we found the cuisine to be outstanding. Since my husband and I both like seafood, for two evenings we tried every seafood dish on the menu. The striped bass, grouper and salmon were creatively prepared with crusts or light sauces, adding flavor to really fresh fish that would satisfy the most discerning palate. We sent compliments back to the chef each evening. A wide selection of luscious desserts topped off each dinner and brought us on to the dance floor. One of the nicest aspects of dining at the Homestead is the nightly orchestra, playing a mix of popular music during and after dinner with dancing until midnight. Breakfast is an abundant, enticing banquet. Served buffet style, its tables overflow with every delicacy one could dream of enjoying in the morning. Special attention is paid to the variety of fresh fruit---blackberries, raspberries, cherries, blueberries, melons---but one can also chose a robust breakfast of eggs to order, ham, bacon, sausages, and much more. Th coffee is superb, especially when they make a delicious cappuccino. Seeing and experiencing all the Homestead has to offer would easily take a full week, even then, each season offers its own programs. First and foremost is the historic character of the setting, which can never change. Taking a tour with Eileen Judah, the charming Public Relations director, whose enthusiasm for this historic setting is contagious, we discovered the Jefferson Parlor. Lining the walls of this large room are the original portraits of each of the presidents who have visited the Homestead, all the way down to President Clinton. George W. is on its way. During the tour with Eileen, I am amazed at the opulence of the Conference Center---standing in glorious contrast to traditional functional conference centers we see in most hotels. We passed along a carpeted hall with many bookcases, and a wall of glass leading to French doors opening to gardens. The carpet was specially woven with colorful dogwoods and rhododendrons in harmony with the springtime outdoors. Seeing the Empire Room, the Crystal Room, the Wedding Solarium and the Ballroom, I can only imagine what a spectacular choice the Homestead would make for a wedding or a conference. The European style spa is another famous attraction. Rated as one of the top 40 spas in North America and the Caribbean, its most unique attraction is an indoor Olympic swimming pool fed naturally by warm spring waters. The huge pool is a swimmer’s dream, surrounded by beautiful arches, Roman style windows, palms and special lighting. There are at least 20 different treatments offered in the spa, all so enticing that it is difficult to choose. I finally settled for the Herbal Wrap---a new experience. I spent 15 minutes luxuriating in an overflowing tub of mineral water straight from the Jefferson Pools. Just as I was falling asleep, to the soothing sound of water spilling everywhere and the melody of a distant flute, a knock came on the door and I was escorted into another room where I was wrapped like a mummy in hot sheets scented with herbs. For 15 minutes I imagined the mummy experience---cozy but confining. The results of my capture were immediate, for when I was released and in the shower, my singing sounded more on key, and I was breathing from my diaphragm. The Homestead is world renowned for golf. Three award winning courses offer miles of perfectly trimmed green grass that hold a magnetic attraction for a non golfer to partake in a long cushioned walk. Golf Magazine’s awarded the resort its prestigious 'Gold Medal' ranking and called the National Historic Landmark one of the nation’s most appealing getaways. The Cascades course is considered by many to be America’s premier mountain golf course. The Olympic size skating rink at the base of the ski run was even more appealing on a crisp, cold day, skating to music surrounded by panoramic countryside. Our plans for a hike to the Cascades Gorge and a ride in one of the antique Homestead carriages were intercepted by snowflakes which came down almost imperceptibly at first. Then we heard that a snowstorm was about to dump 10 inches on us, continuing all day and through the night. We were soon enveloped in one beautiful, magical wonderland. The trees and hills in our view from the room became transformed. Every image was soft and pure, the trees held the snow on their bare branches, creating a lovely network outlined against gray sky. The Homestead took on a new personality; people stayed inside gathering around the fireplaces. The library seemed to attract more readers. After dinner that evening my husband and I went to the Homestead’s charming little movie theater and although 'The Journey of the Swan' was an old movie in video, it all felt very authentic. Plans are in place to update the theater. Hopefully, it won’t lose its quaint ambience. A stay at the Homestead is a multi-dimensional experience, serving not only as a walk through history in the footsteps of presidents, but also as a grand and gracious getaway offering a soothing, healing escape. Located in Hot Springs, Virginia, The Homestead is only 4 hours from Washington. For more information call (800) 838-1766 or (540) 839-1766. Visit the hotel’s website atwww.thehomestead.com. Discovering glimpses of heaven by candlelight was our first introduction to Stonehaven Villas. Shortly after we landed on the Caribbean island of Tobago, power was interrupted, and we stood in darkness outside the airport. However within minutes, the airport’s generators were activated and lights came on. The rest of the island remained without electricity for several hours. We rented a car next to the airport, and with only our headlights to guide us, wound our way through a dark, mysterious island in search of Stonehaven Villas, our home for the next week. Passing through the small commercial area near the airport, we paralleled the Caribbean coast through several villages for 15 minutes until we saw the sign to Stonehaven. We were checked at the security gate, and as we climbed a steep hill leading up to the villas, the headlights shone on grassy slopes covered with red and pink bougainvillea. Even in the dark we could see flowers everywhere. At the reception area we were greeted by Randall, a concierge carrying a flashlight who apologized for the inconvenience of the unlit island, who then showed us to our villa, the Parakeet. Guiding us up the path with his flashlight and unlocking the front door of the villa, he turned to us with a laugh, saying this was the first time he had shown guests around in the dark. He lit candles, and between the light and shadows we sensed the spaciousness and comfort of this 3,700 sq.ft. villa. Assuring us he would return with hamburgers, (Stonehaven’s generators were operating for cooking), and that the lights would soon come on, he left us sitting comfortably in chaise lounges next to the villa’s infinity pool. At that point my husband and I were so thrilled with this dreamlike setting that we forgot about our hunger. We didn’t need anything more --- certainly not something as commonplace as electric light. Lying back in our lounges, looking straight up at a waxing moon, beside us the flaming torches lighting up the huge veranda, we were convinced we had landed in heaven, or at least a branch thereof. We had come to this island on March 13, determined to take a break from the intensity of the buildup to war in Iraq, and had vowed not to turn on the TV. We wanted one week to wallow in the serenity of nature. About 20 minutes later, our outdoor reverie with the moon was interrupted by the sudden burst of light from inside the villa. The pool in front of us became a dazzling sight of azure accompanied by the comforting sound of gurgling water. Everything had returned to normal. We hurried inside to have a clearer look at our villa, and what we saw brought on a spontaneous dance of joy. Our home for seven days was spectacular, and we planned to enjoy every second. Stonehaven Villas was two years in construction and completed in November 2000. It consists of 14 stately, manicured homes, each with its own pool, beautifully landscaped grounds, and wide angle views of the Caribbean and its glorious sunsets. Stonehaven was designed in 18th-century French plantation style by the late, renowned architect, Arne Hasselqvist, who also designed the homes on the island of Mustique in the Grenadines, including the home of Princess Margaret who spent time there. Landscape artist Jennifer Avey created the inspiring ambience during the construction by saving palm trees and spreading tropical plants and flowers in masses everywhere, adding a soft, enchanting touch. It would be hard to find luxury villas anywhere to top this visionary design. On the outside, each villa is set well apart for privacy, blending with the flowering landscape, while inside attention has been focused on the finest details, large and small. The crisp, fine cottons used on the canopy beds and elsewhere come from Trinidad, as well as the hand carved mahogany furnishings. These custom made furnishings, in French Colonial style, create an elegant, yet comfortable, ambience. The compact laundry closet encloses a washer and dryer and shelves abundant with soft, fresh-scented towels. The kitchen is a dream --- from all the drawers filled with sparkling silverware to the glass cabinets containing five shelves of crystal and two sets of china. The kitchen has enough countertop space and large ovens to make even the prima donna of chefs a happy camper. But the best part is that if you are too busy out scuba diving, hiking, sailing or exploring, you have the option of having your own housekeeper ready with dinner upon your return. Every morning around 9 a.m., the front doorbell would ring and the smiling face of Patti, our housekeeper, would appear. After her cheerful, 'Good morning,' she asked if she could cook breakfast for us. Since my husband loves to cook, he was reluctant to relinquish his creativity to Patti; however, we thoroughly enjoyed having her come around. She was friendly and very helpful with our questions about the island as she cleaned, tidied, and did the laundry, and with only our villa to care for, she was ready to meet every need. Should a family with children be in residence, an extra little bedroom for the housekeeper allows her to stay overnight and baby-sit. That delightful green and white cotton room, just off the kitchen, has its own bathroom and can be used for an extra guest. So the villa can comfortably accommodate seven people and even more for a family reunion or a wedding. Stonehaven caters to even the smallest whim for what must be a spectacular wedding party, from the renting of as many villas as necessary for family and guests, down to the bridal bouquet and every detail in between. The energetic and fun-loving deputy manager, Wasipha, amazed us with stories of the lengths the staff of Stonehaven will go in fulfilling the role of 'wedding planner.' Wasipha is the sparkle of Stonehaven, totally dedicated to keeping everything in perfect balance and believing in the importance and long term value of personal service. We spent our days exploring the rainforest, driving the 28-mile length of the island to the sleepy fishing village of Charlottesville, enjoying a great seaside lunch of home cooking at the famous Gemma’s, discovering the secluded Englishmen’s Beach, bird watching and just relaxing. Tobago is famous for its diverse tropical bird population, and many tourists hike the island with binoculars and birding guides in hand. Addicted to the sound of the steel band, wherever it was playing, we were there. We had heard steel bands in the Caribbean before, but none as talented as the Buccooneers, a local band from the nearby village of Buccoo, whose 16 members can play anything from waltzes to reggae to pop, all ingeniously rendered by expert steel drummers alive with enthusiasm and movement. We also shopped at local markets daily and returned to the Parakeet loaded with fresh pineapple, papaya, mangoes, coconuts, and fish to cook on our outdoor gas grill. The spacious veranda, with its polished mahogany table and chairs for eight, is perfect for early morning breakfast, accompanied by happy feathered friends from the neighboring bird sanctuary. Evenings came heralded by a horizon splashed with dramatic, fiery colors and a cool breeze blowing up from the sea. Every night we studied the stars and watched the moon move a little lower in the sky, as though its fullness were weighing it down. On several evenings we donned some civilized attire and went to dinner at the wonderful Pavilion Clubhouse, the center point of Stonehaven. The restaurant ambience is low keyed but memorable, with open air, candlelight, and gentle breezes next to a moon-shaped infinity pool with seascape beyond. The creative menu has ample choices of local seafood delicacies as well as more traditional entrees. Who could have thought that on our last morning, rising reluctantly at 5:30 a.m., allowing ourselves just enough time for one last breakfast on the verandah, we received a spectacular send off. Looking up through the misty morning, we saw a rainbow, arching and double arching, across the sky over the Caribbean. Weeks later, reflecting on our stay, I realized it was the confluence of the Gods: the inspiration of the people, Arne the architect, Jennifer, the landscape genius, the sunsets, full moon, stars and double rainbow that made this serene getaway far more than we ever could have dreamed possible. There it waits --- this branch of heaven --- Stonehaven Villas, only a five-hour direct flight on BWIA from Washington Dulles to Tobago. For more information and rates on Stonehaven Villas, visit their website at www.stonehavenvillas.com. Tel: 868-639-0361. Fax: 868-639-0102. In planning a Paris visit, there is a multitude of hotels from which to choose. It can be confusing, as well as time consuming. Becoming acquainted with the Concorde Hotel Group makes planning a trip to the “City of Light” so much easier. Each address, whether left or right bank, is the best possible starting point to get to know this great city of culture. Renowned for their quality of service and unique design, no two Concorde hotels resemble each other. They vary from intimate boutique hotel to secluded chateau, from royal palace to executive business hotel, and they all carry a dynamic history. All have state of the art technology. On a recent trip to Paris, (see Paris, Falling in Love Again), my niece, Diana, and I experienced the adventure of staying at five Concorde hotels. We were surprised at how distinctively different they all were. Like Goldilocks and the Three Bears, we could not pick a favorite. All were held together by a subtle, bonding thread reflected not only in the beauty of the décor, but in the warm, welcoming, down-to-earth staff. Each hotel held its own wonderful surprise. Inspired by the original style of Napoleon III, the Hotel Du Louvre became the first luxury hotel in France in 1855. At the heart of old Paris, between the Opera Garnier House, the Louvre Museum, the square of the Royal Palace, the French Comedy and the State Council, it welcomed not only the rich and famous, but also artists from around the world. Considered the most Parisian of Paris hotels, its location is still unbeatable. Today, it houses 200 rooms decorated in eight different styles. Opening the door to our chambre, we are immediately drawn in by the daring, scarlet walls and rose tinted rug. The room exudes a deep, rich, relaxing glow. It is as though we have just entered and become part of a warm-toned painting. Tassel–tied, rose colored drapes cover three paneled glass doors, each with its own terrace. Drawing ajar a French door and walking onto the terrace, I am looking from the sixth floor straight down into the quadrangle of the Louvre Museum. To my left, the sweep of the Rue de Rivoli stretches as far as the eye can see. Standing rooted to this spot, surrounded by spectacular architecture, I was suddenly aware that I had stumbled upon a rare moment, one that would last a lifetime. I was here, I was thrilled, and I realized that somewhere in a room above, in the year 1897, Camille Pissaro had stood likewise, on his terrace, so spellbound by this feast for the eyes, that he decided to make the Hotel du Louvre his home for awhile. From this vantage point came several of his great paintings, now displayed at the Getty Museum of Los Angeles. Falling asleep next to the Louvre has the comfort and glory of resting next to a great cathedral or library. It evokes a feeling of reverence for all the great artists who dedicated their lives to the pursuit of beauty. Breakfast in the hotel’s glass enclosed Brasserie every morning was enlivened by its view overlooking the bustling streets of Paris, awake and on the move. Service was both cordial and efficient. In the heart of the hotel is the popular Louvre Bar with red and black curtains and a bar of velvet with armchairs signed by Olivier Gagnere. The Bar is a cozy area for lunch, or afternoon tea and a popular meeting place after work. Among the amenities that makes the Hotel Du Louvre special was the willingness of busy concierges to go to great lengths for guests. We marveled at the sight of Arnaud, who, when he became impatient with the first “inept taxi driver,” came from behind his counter. With grace and style, in black tie and tails, he went striding into the middle of busy Place Andre Malraux, with traffic flying everywhere, to flag down another taxi who knew my address. Thankfully, Arnaud lived to accomplish his mission, and we were on time for our appointment. The Hotel Du Louvre has succeeded in striking the precise chord of gracious hospitality in comfortable, yet elegant, surroundings. Upon discovering this address, discerning travelers can be assured of a secure, dependable friend in Paris, in an unparalleled location. 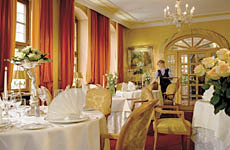 For more information go to www.hoteldulouvre.com. Tel: 33-1/44-58-38-38. In 52 BC the Romans conquered Lutetia, and a thriving town grew on the site of today’s left bank. In 212 AD Lutetia was renamed Paris and became the capital of the Frankish king Clovis. Hence the name given to the magnificent, belle epoch Hotel Lutetia, built in 1910. Located in the heart of the St. Germain de Pres, near the beautiful Luxembourg Gardens, it became the core of the artistic revival during the war years, accommodating numerous notable painters and writers including Picasso, Matisse and Andre Gide. It prides itself on being the first hotel in Paris to get rid of the Nazis and to welcome the GI’s. Today the hotel’s 231 guestrooms still attract international celebrities who elect it as their favorite meeting place, and one can see why. The tradition of art is kept bright and alive at every turn. On permanent display is an amazing collection of sculptures by well-known artists such as Phillipe Hiquily, Arman and Cesar. The Art Deco interior is decorated in warm reds and grays, with subdued lighting and stained glass windows. With this prevailing sense of the artistic encountered at every turn, when we opened the door to our room and saw the Eiffel Tower -- framed in our window, alight and sparkling, we could hardly believe it wasn’t a wonderful illusion. Its magnetism drew us back to the street for a challenging, enjoyable walk until after midnight. An added attraction of our spacious room was a miniature library area where you could work at a mahogany desk besides a floor-to-ceiling bookcase filled with a collection in several languages. Another was the fantastic bathroom with, undoubtedly, the best spa-style shower in Paris. With two spouts on both sides and the traditional one on top, the water was strong and the temperature could be gauged to perfection. This is not to be taken for granted in Paris, where, with a seeming abundance of knobs, one has to figure out just how the shower works before taking a chance. With its glassed-in brasserie terrace, gourmet restaurant, modern fitness center and famous jazz evenings, The Lutetia, a Rive Gauche Deluxe Grand hotel, stands in a world of its own and is an experience not to be missed. This unique setting adds to the total “joie de vivre” of Paris. Check out www.lutetia-paris.com for more information or call 33-1/49-54-46-46. Our first stop on our adventure of discovery in Paris was the Hotel Ambassador. Coming from Charles de Gaulle Airport, my niece and I rolled our suitcases from the Roissy Bus stop at the magnificent Opera Garnier, past the Galleries Lafayette, down boulevard Haussmann and in five minutes we had arrived at the lovely Hotel Ambassador. Standing next to a magnificent floral arrangement, jet-lagged and weary, we received a wonderful welcome from the manager, Herve Le Berre. We were shown to a fabulous suite consisting of two spacious rooms. Designed to create a warm and personal ambience, a sitting room with its own television and reading area and a bedroom. Our jet lag seemed to disappear as we delighted in this perfect start to our introduction to Paris. What makes this hotel unique is how the designer has taken Haussmann designs from the 19th century and transfigured them into the 21st. Later, in a meeting with the manager and assistant manager, they talked about renovations to the hotel. The Hotel Ambassador’s salons are unique in style and here again you see the design of retaining the old and beautiful ceilings with a play of color through special lighting and bold, wide, vivid hues on striped carpets. Any conference in one of the eight salons would be dynamic and lively. The cozy, intimate Lindbergh Bar is where he was celebrated in 1927after his historic Atlantic crossing. The Hotel Ambassador represents the Paris of strolling, of shopping and because of its proximity to the Opera Garnier it lies at the musical heart of the city. It would be the perfect place to stay during the opera season starting in October. The staff is efficient and congenial, and the concierges are particularly helpful, gracious and humorous. For more information visit www.hotelambassador-paris.com or call (33) 01.44.83.40.40. The famous Hotel De Crillon rightfully belongs to the palace category of hotels in Paris. Commissioned in 1758 by Louis XV, the Count of Crillon acquired the palace in 1788. It remained in the prominent Crillon family until 1907 when the Societe des Grands Magasins et des Hotels du Louvre transformed it into a magnificent hotel which opened in 1909. The hotel stands nobly overlooking one of the most beautiful sites in the world, the famous Place de la Concorde. One look in the guestbook recounts its own history of the 90 guestrooms and 57 suites. Being a palace, of course, it caters to kings, queens and the rich and famous of the world, ranging from Richard Nixon, George Bush, Herbert Hoover, King Juan Carlos and Queen Sophia of Spain, to Elizabeth Taylor, Jennifer Lopez and Madonna. The hotel’s 90 guestrooms and 57 suites “Grand Apartments” are exquisitely furnished and decorated with Aubusson carpets, Baccarat chandeliers and Wedgewood china. Our rectangular shaped, luxurious room, with three windows and high ceilings, is decorated in cream and gold, with three chandeliers and a large marble bathroom, It is filled with natural light. The entire atmosphere throughout this luxury hotel is bright airy and spacious. With its own Michelin two star restaurant, Les Ambassadeurs, featuring award winning chef Dominique Bouchet, it is one of the most prominent restaurants in France. The new Ecole des Fleurs, a master class under the direction of Christian Tortu, one of the most celebrated florists in the world, is a unique opportunity exclusive to the hotel. Special packages including 90-minute classes are available. See www.crillon.com or call Concorde Hotels at 800-888-4747, or dial direct: 33-1/44-71-15-01. The Chateau Mont Royal is a fabulous discovery just outside Paris and some 15 minutes from Charles de Gaulle airport. Located in the heart of the Chantilly forest, it is 45 minutes from Paris by RER train. This is where you come to take a deep breath and reconnect with nature. The 18th-century chateau is so beautiful, so refreshing and so comfortable, it is a hotel to fall in love with. Rooms are spacious with great views of the countryside. From our terrace overlooking the forest, my niece and I would return from a hike and sit in tranquility, watching the sun set --a huge ball of orange fire slowly sinking below the tops of green trees, splashing soft colors in a semicircle across the sky. We swam in the indoor Olympic pool, worked out in the modern fitness center, and sang, while playing squash, in enclosed courts with their wonderful echoes. We wallowed in the Jacuzzi and were revitalized in the sauna. Breakfast, in the magnificent dining room overlooking flower-filled gardens and a wide terrace, was a special treat. The café au lait was the best I had in Paris, and the variety of fruits, cheeses, eggs, bacon and sausages were excellent. Dinner in Le Stradivarius, however, was a little disappointing, with a menu not as varied as one might expect. Tiring of traditional French cuisine, which I find lacking in vegetables and greens, my craving for a good salad was accommodated by the gracious waiter, Eric, who without much ado presented a refreshing green salad with tomatoes, onions, herbs and seasonings. A visit to the nearby Conde Museum is a must, within walking distance from Chantilly and a 20-minute drive from the Chateau. The museum is a miniature Louvre established by the Duke of Aumale. With a collection of 800 paintings, it is a mecca for historical French painting, which can be viewed leisurely, as the museum is not crowded. The quiet village of Chantilly has some excellent restaurants including La Ferme. A stay at the Chateau Mont Royal is an exercise in total relaxation. The professional staff is dedicated to the care of their guests, as well as the unique grandeur of the setting. For more information see www.chateau-mont-royal.com or tel: 33-3/44-54-50-50. In planning a trip to New York, the first step is to fine the perfect place to stay. For a woman traveling solo, location has the highest priority. Although crime is down in New York and taxies are in abundance, if the trip includes a late dinner, or business meeting, enjoyment could be spoiled by concerns over the unknowns or unpredictability of some area of the city... Ambience may be next, then attitude of staff. Once the perfect combination is found, a hotel can become a choice 'home away from home' and a great attribute in the enhancement of future trips. Located in a lovely residential area on the fashionable East Side, the Hotel Plaza Athenee was undergoing an exterior makeover when I arrived. Even the name of the hotel was somewhat obscured by planks and ladders leaning against its scaffold enclosed exterior. I could only catch glimpses of its lovely face. Inside, however, was warmly aglow -- basking in a fresh new look which brings to mind an old restored masterpiece. The front desk staff had the welcome combination of being professional without being automatons. My room was small, but exquisitely decorated in European style with great attention to fine details, as in fabrics and furnishings. It is well-equipped with high speed internet service. In the windy, freezing March weather, it was a pleasure to look from the window of my cozy and secure abode and see the swirling snowflakes begin to soften the dark, worn rooftops of New York in feathery white. One of the main attractions of the Plaza Athenee is the award-winning Arabelle restaurant which opened in 2001. Beneath a golden dome, pastel banquettes and beautifully upholstered chairs, patrons dine in elegance. Accents of baroque murals with pagodas and faux conservatory windows create anEast meets West ambience which is both soothing and relaxing. It is the creative originality of Executive Chef Raymond Saja who has made the Arabelle a famous landmark restaurant in New York. He has been lauded for his fusion of the world’s most intriguing flavors in an array of fresh and exciting dishes. The other famous attraction is the Bar Seine -- a favorite meeting place for both discerning Manhattanites and guests who may be on an off-time for dining in the restaurant. The service is excellent. Its amber lighting emanates a warm glow. The unique design is in dark wood and animal print fabrics and is trimmed with some amazing pieces of Moroccan and Anglo-Indian artwork. What makes this hotel great is the truly residential feeling. Walking outside and just around the corner offers some of the best shopping areas in New York. Built in the style of a Gothic castle and endowed with the traditional warmth of Irish congeniality, the Adare Manor Hotel and Golf Resort steps back in time to a more gracious and hospitable era. Close to Shannon Airport, this is the ideal first stop on a tour of Ireland’s southwest counties. Flights from the US arrive at Shannon from 6 to 7am. For visitors to Ireland, this can be difficult -- facing the challenge of driving on the left when tired, and staying alert on the antiquated, sometimes poorly directed,roundabouts. The Adare Manor offers a grand welcome within a reasonable distance. A stay at Adare ensures the perfect introduction to an enjoyable sojourn in Ireland. Entering through the ornate black and gold gates, we stopped at the gatehouse security check, then drove down the long avenue through beautiful grounds toward the towering manor. Set on 840 lush acres, it appeared like a beautiful mirage, a castle in the distance. At the entrance we were greeted byBernard, the smiling doorman in tall hat and tails. It was then we crossed the threshold of Irish hospitality, and entered one of the country’s most gracious, historic settings. The structure was initiated in 1832 by the Second Earl of Dunraven and his wife Lady Caroline Wyndham. During the years of construction, Ireland was struck by the potato famine which devastated the population. Adare Manor bacame the primary source of employment for the villagers of Adare. There are 52 chimneys, 75 fireplaces, and 365 leaded glass windows in the original residence. Entering the grand foyer, we could feel the flames of Irish charm radiating from a warm fire, and welcoming smiles soon wrapped us in a soothing blanket of tranquillity. The no hassle check-in added to the smoothness of the manor’s high standard of guest protocol. Our “stateroom” was palatial, with five casement windows overlooking gardens and the swiftly flowing river Muragh, a tributary of the Shannon. The room was elegantly decorated with rich wood furnishings and exquisite fabrics designed by world-renowned Carlton Varney. All rooms have luxurious marble bathrooms with double sinks and an abundance of fluffy towels. Looking out the window on a dull November day, I saw a white swan, still as a statue, lost in contemplation, under a wooden bridge. The grass on the banks of the river was such a deep green, it stirred the imagination by seeming to hold the history of Ireland in each strong blade. The trees were shedding their last autumn leaves. A graceful maple tree has dropped red, yellow and orange leaves in a perfect circle around its trunk, and the river was close enough to see a sprinkling of leaves being carried lightly off on its surface. This peaceful setting was conducive to a rapid decline in jet lag. Settling into this castle-like atmosphere was easy. A November walk in the formal gardens and along the river gave us a chance to inhale the freshness of the countryside. There are a wide variety of indoor and outdoor activities available for guests, from salmon fishing, to spa treatments, to a workout in the beautiful indoor swimming pool and fitness center. The estate also has the finest in facilities and professional instruction at the Equestrian Center. After an hour of horseback riding at the Equestrian center a visit to the spa for a massage can be very rewarding. Although we didn’t play golf, Adare is renowned for its majestic, parkland golf course. The Adare course opened in 1995 and was designed and built by Robert Trent Jones Jr. It stretches 7,138 yards from championship tees down to 5,082 yards (incorporating 4 tees per hole). A 14-acre lake dominates the front nine holes, while the back holes are routed through wooded land. The river Maigue meanders through the course. As a 5-star, championship golf course, open year round, it has rapidly become known as one of the very finest in all Ireland, while retaining a customer friendly golf experience. A tour inside the manor leads to surprising discoveries. At one point we found ourselves in the Minstrel’s Gallery, 132 ft, long and 26 ft. high. Walls are lined on both sides with Flemish Choir Stalls. This beautiful hall of mirrors was clearly inspired by the Palace of Versailles. One can only imagine how glorious the occassional luxury wedding appears in this grand ambience. Dining at Adare Manor’s castle-like atmosphere surrounded by candlelight, arches and soaring ceilings is a memorable experience. Dinners are long and leisurely, the service is excellent, and the Irish and Continental dishes expertly prepared and presented. Since location is considered everything when traveling, an added attraction at Adare Manor is its setting in the heart of charming Adare village with its variety of boutiques, restaurants and souvenir shops, many in original thatched-roof cottages, all restored to absolute, traditional standards. In short, we haven't found anything to match the Adare Manor as the ideal first stop on a trip south to the Ring of Kerry and the southern reaches of Ireland’s most spectacular landscape. We were tempted to relax here much longer, next time we will!. For more information and Special Package deals visit AdareManor.com or call 800-462-3273. An unforgettable evening in one of the world's most beautiful ballrooms will take place in January, 2006 just across the plaza from the Hotel Taschenbergpalais. The Saxon State Opera hosts the revival of the Semper Opera Ball on the night of January 13, 2006 in the splendid halls of the Semper Opera. The Taschenberpalais is a sponsor of the event that promises to offer a brilliant program and atmosphere like no other in Europe. The Semper Opera Ball was initiated by the Director of the Hotel Taschenbergpalais who is president of the Semper Operaball, along with the artistic Director of the Saxon State Opera and Dresden's Semper Opera. More information on the Opera Ball is at www.semperopernball.de or phone: 49 351 4912-503. Looking out any of the five huge windows of my room at the five-star Hotel Taschenbergpalais, I thought how this had to be the perfect location in Dresden. I could see the Theaterplatz, one of Europe’s most beautiful squares with a panoramic view of Dresden’s cultural splendor. In the shadows of a soft twilight evening, I could see spread before me the courtyards of the Zwinger, and the surrounding baroque architecture, including the Semper Opera House, the Catholic Court Church and the Residential Palace. All this, on my very doorstep, was cause for exhilaration. The history of this unique setting is turbulent. It began in the 18th century when Augustus The Strong, the Elector of Saxony and King of Poland, had a palace built for his mistress Countess Cosel. However, when she fell out of favor and was sent to the Stolpen Citadel, he repossessed the palace and made it the residency of the Wettiner Crown Prince. For almost 250 years the Taschenbergpalais was one of the primary attractions of Dresden, a center for social life, attracting royalty from all over Europe. Taschenbergpalais thrived as a landmark adding its own spectacular beauty to the Theaterplatz until the Bombennacht (night of bombs) on February 13, 1945. Like almost all of Dresden it was destroyed by the Allies three months before the end of WWII. Only parts of the walls remained standing for the next 48 years among the ruins of this once magnificent palace. In February 1993, meticulous reconstruction began using as much of the original structure as possible. Costing 250 million DM, the reconstruction preserved external baroque walls, stuccowork, sculptures, fountains and staircases. The palace opened as the first five-star luxury hotel in Saxony on March 31, 1995. In our own exploration of the hotel, late in the evening, we found elegant, wide halls interspersed with alcoves filled with sculptures, sitting areas with columns and a 13th-century cellar turned into a restaurant, all adding to the palatial atmosphere of this lovely hotel. Especially remarkable are fountains in the courtyard where guests enjoy elegant outdoor dining surrounded by a sense of history. The sweeping baroque staircases have been faithfully reconstructed. All 213 guestrooms, including 25 suites, are spacious with soaring casement windows and high palatial ceilings. It was surprising to find a modern interior motif, but it works well as a blending of baroque style with contemporary elegance. Rooms exude an ambience of crisp clarity with the royal blue fabrics contrasting with hand crafted, red elm wood furnishings, red scatter pillows and silken sheets. Black granite bathrooms have heated towel racks and floors to keep your toes warm. A large desk conceals phone jacks with ISDN lines, fax and PC connections. Buffet breakfasts are fabulous and can be enjoyed outdoors among the fountains, downstairs in the vestibule among baroque columns, or in the Intermezzo restaurant, you can try a different ambience each day. One of the best evenings of our visit to Germany was spent in the Sophienkeller, located in the original, 13th-century cellar vaults of the palace, a very popular Dresden restaurant. Hearty Saxon food is served at large tables that encourage conversation and German 'gemutlichkeit.' Seated at our table were two women from the Black Forest and a doctor and his wife from outside Munich. In an atmosphere of fun and spontaneity, people trade stories and drinks and join in the singing. A King and Queen are chosen and paraded around the hall to the sound of trumpets. Waitresses dressed in Dresden folk costumes participate in the hilarity of the evening while serving from an extraordinarily varied and scrumptious menu. The hotel also has a very inviting, well-equipped fitness center, spa, solarium, sauna and large indoor, heated swimming pool. There are opportunities to play golf nearby as well as hike in the mountains. The Kempinski Taschenbergpalais has received numerous awards for excellence, including two Diner’s Club Service Excellence Awards, and is listed among Germany’s top three Grand Hotels. Its business and banqueting facilities offer every amenity that would be expected of a five-star hotel. Returning on Memorial Day to my favorite oasis in the southwest, Tucson’s Arizona Inn, I carried with me the memories of my last visit two years ago and, with it, the anticipation of pure tranquility. During 2006, the Inn celebrates its 75th anniversary. I wondered, as I traveled to Arizona, if the crass, flamboyant outside world had clutched the Inn in its greedy tentacles. As I walked through the Inn’s impressive library, visiting the glass-enclosed, rare books and reclining on soft cushioned sofas, I was delighted to discover that the Inn is still intact, its ambience is still robust. It remains true to the legacy of Isabella Greenway’s timeless promise to provide guests with privacy, repose and sunshine in a quietly elegant setting. Today, Will Conroy, filmmaker and son of proprietor Patty Doar, leads the Inn into the future. A visitor’s curiosity may be aroused by the several portraits of Isabella Greenway on the walls of the library which show a beautiful woman who exudes a compelling strength of character. With the help of Kristie Miller’s excellent biography, Isabella Greenway, An Enterprising Woman published in 2004 by University of Arizona Press, one finds an intriguing portrayal of the famous Isabella. She is described as an unusual combination of drive, ambition and good looks -- a woman considered ahead of her time. The first congressperson from Arizona, Isabella was a close friend of Eleanor Roosevelt and a key political player in the New Deal. A successful businesswoman, she ventured into ranching, the airline industry, furniture manufacturing and hotel management. She also had time for true love and romance. For past and future patrons of the Inn, the Isabella Greenway biography is a must read -- a clearly defined thread with the past that explains why so many of us find a real attachment to this oasis of refined living. Tucked away in a residential corner of Tucson, fringed in pink Bougainvilleas and filled with the sounds of chattering birds, the Arizona Inn stands in a gracious world created seven decades ago by Isabella. Today, with its 17th through 19th-century antiques and ritual afternoon tea in the library, it maintains and cherishes all the refined elements of a bygone age. Crossing its threshold is like stumbling across a great biography --a gentle introduction into the life and tastes of a remarkable woman, Isabella Greenway, who’s life journey shows a unique ability to bring together all the diverse pieces of her mind and soul. A Renaissance woman, she was first a debutante, then a bridesmaid in the wedding of Eleanor Roosevelt; she married, became a mother, was twice widowed, was an entrepreneur and grandmother, and eventually became Arizona’s first Congresswoman. After only a few hours exploring the inn, which has 86 rooms and three private houses, I had the distinct impression that I had entered Isabella’s world. Her serene, yet lively, spirit exudes from every corner of the hotel’s décor with the power to keep the past very much alive. With my room key in hand, and the outline of the Catalina Mountains in the distance, I crossed the rich, green grass, past the ping pong table and under an archway, to find number 121, a deluxe suite. The rooms were huge and airy, with high, open-beamed ceilings and wood floors, a fireplace with antique settees, a huge walk-in closet and two nice-sized bathrooms, abundant in towels and all the amenities. Standing in the center of the suite, with a soft breeze issuing from front and back terraces, I could feel the spirit of this tranquil setting. Taking a deep breath, I was exultant: “What a wonderful discovery,' I said aloud. The Mediterranean style architecture is governed by a simplicity that I associated with northern Malaysia or the island of Mustique in the Caribbean. I could be anywhere in the world. Outside my door was a tree and shady umbrella, with table and chairs, where I could read and write in complete solitude. Around the corner and across a labyrinth of flagstone, zigzagging paths, past flowers and trees, was a hidden Olympic swimming pool completely screened by fragrant bougainvilleas and oleander trees. Next to the pool are tennis courts and an exercise center. The Inn lies on 14 acres of manicured lawns and gardens. Dining with Patty Doar, owner and proprietor of the Inn and granddaughter of Isabella, was a memorable affair in many ways. Besides learning more about Isabella, I experienced one of the most creative cuisines found anywhere in the world, and rated at the top among Tucson’s many restaurants. I enjoyed a five-course dinner, which included mushroom crusted salmon wrapped in asparagus, and a sea bass herb crepe. Intrigued by the meeting of French sauces and Southwestern cuisine, I met award-winning Chef Odell Baskerville, a witty, enthusiastic man who takes pride in the flair and creativity he expresses so well in his art. The dining room has become the “Who’s who” meeting place for business dinners and luncheons in Tucson. Baskerville has made the Arizona Inn a superb dining experience, and I would guess the secret lies in his imaginative combinations as well as his light, but interesting, sauces. The coveted Silver Spoon award may very well be repeated for the foreseeable future. Breakfast by the pool was the epitome of relaxation, the buffet was abundant in fresh fruit and yogurt and all the usual American breakfast delights. Although I truly enjoyed the selections as well as the orange and gardenia trees around me, a café au lait was hard to find. In a way, the birth of the Arizona Inn was an afterthought for Isabella who, in 1927, was very involved in helping disabled veterans of WWI, and their families, make a living in Tucson, which, because of its climate, was a haven for wounded combat veterans. In February, 1927, she founded the Arizona Hut, an enterprise that made commercially salable furniture, and by April, sales of hand-hewn household items were in full force. By the end of 1928, the Hut had a gift shop, a manufacturing plant, and outlets in Marshall Fields, Saks Fifth Avenue, Bonwit Teller and Abercrombie and Fitch. With the 1929 stock market crash and a failing domestic economy, Isabella Greenway found herself in a dilemma, left with a warehouse full of furniture. A friend commented that she had enough furniture to open a hotel. Examples of the work of the veterans are to be found throughout the Inn: two hand carved banquettes grace the beautiful Victorian style library, which also holds a grand bookcase filled with the classics, including one of my favorites, Romain Rolland. At Christmas the room holds a 15 ft. decorated pine tree. The library has fascinating paintings -- one of Isabella’s husband, looking young, healthy and handsome, who tragically contracted tuberculosis. Isabella nursed him for almost a decade before he died. Another painting, done in naïve style, was a brightly colored polygram of the Arizona Inn’s history, painted in 1930 by Allen Mardon. I watched a baby guest attracted by the colors, pointing her finger to get her mother’s attention. She was obviously a born art connoisseur. Every room at the Inn has a sample vintage selection of desks, dining room tables and chairs. The Hut’sfurniture has a simple, naïve style; some pieces are painted, and all are hewn from a variety of woods: walnut, mahogany, cherry and maple. It is a delight to tour the Inn and discover the past with the granddaughter of Isabella Greenway, whose life story I had come to admire so much. Among Isabella’s art collection are some poignant pieces from the last paintings of a vanishing world of Indians. In the hotel bar she displays artifacts she picked up in her travels to Rhodesia and a collection of Audubon prints which had been presented to her by the artist. When we came to the house Isabella designed and had once lived in, I was intrigued. It was across the street from the hotel and mostly obscured behind a gate and a convergence of flowering trees. In the foreground was an oval pool and gardens. There are also patches of desert, which as Doar explained, “Were kept to see a bunny rabbit or a pheasant running around.” Almost on cue, we saw a beautiful wild pheasant strut by, adding more color and life to the surroundings. “That pheasant has been here a few days now, and I don’t want any harm to come to it,” Doar says. This private home, with eight bedrooms, was built in 1949, and each room contains furniture from the Hut, which provides a distinctive, old feeling. On a wall in the living room I saw a painting of a beautiful woman. In a little anecdotal memory of childhood, Doar recalled an evening when she had a terrible headache and fever. The house was filled with company, and nobody was paying much attention, but her grandmother noticed and stayed up with her all night, applying cold compresses. “I was completely well by morning,” she smiled. Isabella’s house, as well as two other houses on the property, can be rented from two nights to an entire month. Leaving her home, my one regret was that I would never meet Isabella Greenway. Along with many others, I can look forward to her biography, written by Kristie Miller, published by University of Arizona Press, and due in the fall of 2004. Even before visits by Clarke Gable and Gary Cooper, and ever since, the Arizona Inn has had a continuous flow of the rich and famous, their privacy always well protected, nobody ever divulges any names. All are no doubt attracted by the complete privacy the hotel offers in a unique and tranquil setting. Seventy years of continuous family ownership has earned the hotel a place on the National Register of Historic Places and a Zagat rating as one of the 100 best hotels in the country. Travel and Leisure andConde Nast include the Inn among their best places to stay worldwide. For more information and reservations: (800) 933-1093, or visit www.arizonainn.com. One stay at Biras Creek Resort was enough to convince me that it would be better to be washing dishes in these surroundings than to be anywhere else on earth. Lovers of sights and sounds of the sea will rejoice in the discovery of Biras Creek, one of the most naturally spectacular and low key resorts in the Caribbean. Nestled on a saddle of land between two hills on a 140-acre peninsula of Virgin Gorda, Biras Creek is a feast for the eyes. At the precise meeting point of the tranquil, blue Caribbean and the moody, wild Atlantic, high on a promontory, sits the picturesque restaurant fashioned from an old sugar mill. The deep, rich, constant sounds of the churning sea on the doorstep of your two-room villa lulls you to sleep at night. The black sky, filled with layer upon layer of stars, is an invitation to cuddle under a blanket on the open terrace and watch wispy clouds cross the Milky Way. Each morning brings the sounds of bird song as early riser’s hop on their own bicycles and ride up to the hilltop stone restaurant for breakfast. This hub of activity also houses the reception area, a snooker room, intimate library and pavilion, all offering breathtaking views. Biras Creek has an open, airy atmosphere -- it flourishes in a world of its own far from modern-day pressure, without TV, or newspapers. You could easily lose track of the world if it were not for a condensed version of the news faxed every morning from New York. Thirty-two suites including 2 Grand Suites are scattered along the Atlantic shore, positioned to ensure total privacy. Suites are comfortable and colorful without being plush or elaborate. The ambience and decor is casual, relying on its theme from nature. Each suite has its own large, private terrace and comfortable furnishings -- just steps from the Atlantic. A real novelty is the outdoor shower in a small, walled garden off the bathroom with a view of the white caps on the Atlantic and either the sun or stars shining down. The quality and presentation of the award winning, international cuisine is consistent with the resort’s membership in the prestigious Relais & Chateaux hotel group, bestowed only on the most outstanding inns, hotels and resorts worldwide. In particular, the dinner menu, with its choice selection of top quality meats or fresh fish served in light sauces, followed by outlandish desserts, is the perfect completion to each memorable day. Guests look forward on Mondays and Wednesdays to the traditional beach barbecue lunch abundant in fish, spare ribs, sausages, hamburgers and a variety of salads and desserts. This can be enjoyed in swimsuit and sandy feet. The treatment facility houses two massage suites (each with its own changing room, bath and shower), a manicure and pedicure room, a waiting and relaxation area and an outdoor yoga platform. A potpourri of Decléor therapeutic treatments is offered, such as body and facial treatments, wraps, massage, and one-to-one yoga, among others. It is only available for guests of the Resort. Decléor is recognized in Europe and throughout the world as the premier expert in the scientific approach to aromatherapy applied to beauty and well-being. The originality and effectiveness of the Decléor essential oils and beauty products are unmatched anywhere else in the world. The long, white, shaded beach offers plenty of space for sunbathing or taking to the sea in a sailboat, catamaran or windsurfer. A young British attendant is always around for a quick sailing lesson. Biking is a major part of the novelty and fun of Biras Creek. You can ride everywhere getting plenty of exercise on gentle hills, inhaling the glorious scent of tropical flowers and wallowing in an exalted sense of freedom. At the manager’s cocktail party, honeymooners and other happy, satisfied guests, shared stories about how they had discovered this little piece of paradise. Most of them found Biras Creek on the hotel’s website while searching for a special place to stay in the Caribbean. Easy to reach, fly to San Juan or St.Thomas. Connect with a commuter flight to Tortola. The (prearranged) Biras Creek launch brings you right to the Biras dock on a fantastic half-hour boat ride. For special packages and more information, call Ralph Locke Islands, Inc. at (800) 223-1108. To cross the threshold of the Hotel Meurice, which faces the Rue de Rivoli and Tuilieries Gardens, is to enter the world of 'gold and pleasure,' a microcosm of the glory of Napoleonic Paris. A huge dome throws natural light across mosaic floors. Registration is painless. No tedious waiting in line -- a signature in exchange for a key and a bellman escorts you to your room. Security is subtle but reassuring. The key is needed to move the elevator as well as to unlock your room. Interspersed along the hallways are antiques that artfully blend the splendor of the past with the polished sparkle of the new. There is the faint scent of spring blossoms. When the door closed behind the departing bellman, I sat in a chair in this exquisitely appointed room staring at a dozen yellow roses set against a backdrop of rich blue and gold brocade drapes. The silken tassels loosely tying the heavy fabric into rich folds symbolized for me, the tastefulness of maintaining the interior character of grand hotels in accordance with the architecture and finesse of their birthright. .
My large bathroom was crafted, floor to ceiling, in Arabesscato (white and gray) marble, with glass walled shower, large bathtub, abundant towels and terry bathrobes. Its radiance emanated a welcoming comfort. In upholding the royal tradition and history of a bygone era, designers have struck precisely the right chord. The unique history of this venerable property, which belongs to the Dorchester Hotel Group, began in Calais in 1771. Upper class British travelers on their way to Paris would cross the Straits of Dover at Calais where an enterprising regional postmaster, Charles-Augustin Meurice (1739-1820), welcomed them to French shores. He put them up in his Calais coaching inn, and arranged rides to Paris aboard his coach service. Since it was a 36-hour trip, Meurice decided to build a second coaching inn in Paris in 1871. The hotel’s fame grew. A newspaper clipping from 1855 mentions that Queen Victoria stayed at the Meurice during her visit. After the first renovation in 1907, Alphonse XIII of Spain made regular visits, followed by European royals and the Grand Duchess of Russia. Because of its popularity with the royals, The Meurice went from being dubbed the 'City of London,' because all the staff spoke English, to its new image as the Hotel des Rois, the Hotel of Royals. From 1930 to 1938, Franklin Roosevelt, Rudyard Kipling, Ginger Rogers and Coco Chanel were guests. The Meurice hosted the wedding of Picasso and Olga Koklova. Salvador Dali was the hotel’s most outrageous guest, spending a month there each year. During one stay he requested a flock of sheep be sent to his room and starting shooting at them with blank bullets. I was particularly intrigued by one piece of World War II history. Like many hotels in Paris, Hotel Meurice was taken over by German authorities, and in June 1940, the Kommandantur du Gross-Paris was installed here. Hotel services were sustained with personnel who had not been mobilized. General Dietrich von Choltitz, who led all German tactical support in Paris from July 1944, stayed in room 213. He had direct orders to resist until the last man died. He was to destroy Paris monuments with a system of mines the Germans already had in place. However, under the advice of one of his majors, Norman Gunther, who loved the French capital, he spared Paris. On August 25th 1944, General Dietrich von Choltitz surrendered to Force Francaise Interieure, which had come to capture him. A guided tour of the hotel could easily compete with a tour of one of Paris’ renowned monuments. On the seventh floor is La Belle Etoile Suite with an expansive private terrace. The 3200 square-foot suite, with upstairs and downstairs and four bedrooms has an incredible rooftop terrace of 2700 square feet. The suite and its view are spectacular at any time of the day but, in the evening when the lights of Paris are dazzling, a walk around that terrace, with its 360-degree view of famous landmarks offers another unforgettable memory of a noble city. One should plan a visit at five minutes before the hour when the lights of the Eiffel Tower do their dance, rippling up and down for ten minutes every hour. The 19th-century architectural style of this suite is reminiscent of buildings such as the Petit Palais with lots of steel and glass and a zinc roof that weathers to a green color. Dining in La Meurice Restaurant is the nearest thing to dining at The Palace of Versailles. The room is filled with ornate gilding, Louis XV-period chandeliers, antique beveled mirrors, and large bay windows framed in rare marble. Landscape paintings adorn the walls and the painted ceiling depicts a blue sky with angels. All were carefully restored during the renovation. There was great attention to detail in the service and quality of this most pleasant dining experience. Attentive waiters respond quickly to every nuance of need by their guests. Sitting in La Meurice, enjoying the breakfast buffet, surrounded by plush, artistic elegance, provided me with the golden lantern to embark on my exploration of the nearby Louvre and the Musee d’Orsay. The Spa, located on the mezzanine around a garden courtyard, conveys a simple purity with marble, wood, stone and glass. Besides a well-equipped fitness center, the spa has a Jacuzzi, sauna, and steam bath. The Claudalie Espace de Bien Etre features skin treatments and specially trained masseuses from Les Sources de Claudalie, the world’s first vinotherapie spa. It seemed to me that Paris would not be Paris without the additional splendor of the Hotel Meurice. A stay at the Meurice is like the gobs of airy, fresh whipped cream that turns a French pastry into a delicious masterpiece. For reservations, rates, and information contact your travel agent or the hotel directly. The Hotel Meurice belongs to the Dorchester Hotel Group and is a member of Leading Hotels of the World. (800) 223-6800. It's impossible to imagine a more perfect introduction to Turkey than as a guest at the Ciragan Palace, on the shores of the Bosporus, where the mystical, magical aura of this ancient culture begins to unfold. Once the residence of the Ottoman sultans, the Ciragan Palace was rebuilt in marble for Sultan Abdulaziz in 1857, but was damaged by fire in 1910 and, for 76 years, lay abandoned. Finally, in 1986, it was rescued and restored to its original splendor by the Kempinski Hotel Group. Renowned for their dedication to continuing a European heritage of quality lifestyle, which has set their standard of hospitality for the past century, Kempinski was a perfect match for developing the potential of this grand site. From the moment you walk through the palatial front door, you enter a world of relaxed elegance and refinement. The Palace’s gracious, efficient concierge staff appear to really enjoy being of assistance. The hotel’s 295 rooms and 15 suites have private balconies and magnificent views of either the Bosporus or the Palace gardens. Guestrooms, with their own separate hallway, are spacious, with marble bathrooms, rich fabrics, and beautiful Turkish carpets surrounded by parquet floors. Few hotels in the world can recreate the palatial atmosphere with as much authenticity as has been achieved in this reconstruction. The process took six years, and was overseen by the Turkish curator of historic monuments, who insisted on finding and using original materials. The Ciragan Palace is actually two buildings; one is the restored sultan’s palace and the other, connected by lavish corridors, is the hotel itself. Upon exploring the silken carpeted halls and corridors of this royal hotel and the adjoining palace, you discover the Turkish legacy from the era of the sultans. It includes an extraordinary collection of art, artifacts, jewels, precious metals, fabrics and a myriad other manifestation of opulence. Guests can sample the culinary riches of the hotel’s four world class restaurants. In the evening you may thread the silken halls to the palace to dine under chandeliers. With regional specialties from Italy, the Bellini was my favorite. The elegant, but relaxed, atmosphere, the creative original touches and the excellent quality of each selection, including the wine, combined to make it a memorable evening. Not only did it restore my nutritional balance, but I seemed to immediately recover from jet lag. The Tugra restaurant, across the marble hall from Bellini, specializes in traditional Ottoman cuisine. To enjoy the Tugra’s unique and opulent atmosphere, and a cuisine created from genuine Palace recipes, is truly an evening well spent. After dinner, a stroll along the promenade by the edge of the Bosporus, is another way to capture the atmosphere of the days of the sultans at the height of their glory. With the scent of flowers from the palace gardens, a full moon above, and the lights from boats moving along the Bosporus, the Ciragan Palace is, without question, one of the most peaceful, romantic settings the world can offer. Surrounded by lush gardens, the hotel features a casino, three meeting rooms, a snack lounge, several intimate bars, a gallery of exclusive shops, hair salon, travel agency and a Business Center always available with a secretary. The well-equipped Fitness Club includes an indoor/outdoor swimming pool, a Turkish bath, 9-hole putting green, gymnasium and jacuzzi. The Palace is a short taxi ride to the business and cultural sections of Istanbul. The Ciragan Palace is a member of Leading Hotels of the World. For more information: (800) 223-6800. Internet: www.ciraganpalace.com. E-mail: reserve@ciragan-palace.com.tr. Today hotels across the world tend to look familiar, simply because they are! Ultra modern styles are repeated over and over, from Beijing to Washington, and for the pre-occupied business person seeking only efficiency, sometimes ambience is not important. However, for the experienced traveler still seeking quality, something soothing happens when crossing the threshold of Dresden’s five-star Hotel Bulow Residenz. Not only did I find efficiency and a genuinely warm welcome, but it was as though I had taken a giant step back in time to a refined era when attention to the finest detail was an art. Built in 1730, the Bulow Residenz has gone through many incarnations, but was fully and magnificently renovated in 1993. The location is just across the Augustus Bridge in the center of beautiful, baroque Neustadt, where no matter where you walk the architecture is both stunning and intriguing. The Bulow is just the kind of residence visitors to Dresden might find in history books and novels, but never have the opportunity to truly experience. It was built as a manor house in 1730 by the same architect, Johann Gottfried Fehre, who completed the landmark Frauenkirche (Church of Our Lany) after the death of the original architect, George Bahr. In 1990 the manor house was purchased by Horst and Monika Bulow of Stutgart, who resurrected it from a sad state of dereliction to a life of quiet exuberance. In 1996, with five luxurious suites and the renowned Caroussel restaurant, the Bulow Hotel Residenz became the first hotel in the former East Germany to join the prestigious Relais & Chateau Group. A sparkling, glass enclosed elevator brought me to my room on the 3rd floor. I was bemused to see images of myself on all sides slipping off into infinity. I thought this singular, ultra modern convenience would, for some, serve as a great deterrent to cloning. My spacious room immediately struck me as perfect. Decorated in warm shades of red with red brocade and accents of gold, it was comfortably furnished with a couch, a wing back chair, desk and king-sized bed. Maybe it was the three small casement windows opening onto the street below that completed my sense of connection with the old world surroundings. I could lean out the window and admire the winding, narrow cobbled streets of the Neustadt, all so peaceful with hardly a passing car. The room had a flat screen TV, internet access, dial direct telephone, minibar and a nice sized bathroom where everything gleamed in a way that reflects careful maintenance. Keeping all aspects of the hotel running smoothly is Managing Director Ralf Kutzner, who was chosen Germany’s 2004 'Achiever of the Year' by society magazine Bunte. Then, four years later he was awarded “Hotelier of the Year” by Germany’s Gault Millau. Kutzner has lived and traveled across the world since his childhood and has a rich international background in the hotel business that includes Bangkok’s Mandarin Oriental Hotel. He takes great pride in the Bulow and in his staff, which probably transfers to staff every morning when they meet as a group. Shaking hands with each, he looks in their eyes and can tell what kind of day they will have. It may be that little ritual that holds the key to the Bulow’s success. The Caroussel, Dresden's top gourmet restaurant, is a major attraction of Dresden’s elite -- artists, musicians, politicians, even Chancellor Merkel when she is in town. It is a place for celebration of the good life, where every brilliant presentation brings a cacophony of unique and creative flavors. One year after it opened the Caroussel was awarded a much coveted Michelin-Star, which has been sustained every year since. Chef Dirk Schroer comes from a background of service in some of Germany’s most prestigious restaurants. He focuses on combining highly nutritional products, so that patrons quickly realize the preparations not only taste great, but are wholesome. Sitting down to a five-course dinner, including appetizers, soup, a saddle of lamb with coriander spinach, red and white wine suggested by Sommeliere Roswitha Ringel, and ending with a fabulous, freshly made chocolate soufflé with cherries and sour ice-cream, I can attest to the fact that the cuisine, though filling, was light. In fact I could have started all over again. Enjoying every moment of my surroundings, I was both satisfied and impressed. A continental breakfast is complimentary in the lovely inner courtyard which is open when the weather is good. For guests who have come to Dresden on business or to explore Dresden’s history and culture, the Hotel Bulow offers the ideal location in a Baroque setting. As I walk across the Augustus Bridge that spans the River Elbe, rising before me like a mirage is the newly restored historic center that was bombed in 1945. Whether in the soft light of early morning, or in late evening when the pink glow from the setting sun splashes on the long stretch of domes and towers, I know I am walking toward an inspirational epoch of history -- and it feels like a great privilege. In November, a second, larger Hotel Bulow Palace is scheduled to open in the same baroque area of Neustadt. The Hotel Bulow Residenz is a member of K Hotels, known for its luxury boutique hotels and resorts worldwide. For more information on the Hotel Bulow Residenz, visit the website at Buelow-Residenz.de or call 49-351-800-30. Although the capital city of Ireland is filled with 4- and 5-star hotels and abundant B&B's, there is one hotel that stands in a realm of authenticity and quiet splendor -- not only representing all that is good about Ireland -- but literally the heartbeat of Dublin's rich history. At the 5-star luxurious Shelbourne, a landmark since 1624, a guest is never far from the history and culture of Ireland. The lobby, where first impressions are made, is cheerful with polished Italian marble floors, sparkling chandeliers and a magnificent decorative stained glass skylight overhead. On the walls are some intriguing diptychs of Didi, Gogo, Lucky and Podos -- characters from Beckett's 'Waiting for Godot' -- which speak to the rich literary dimension of this small country. The reception desk is a special asset to the hotel with its efficient staff who graciously combine the speed of registering with warm and accommodating personalities. The Shelbourne, Dublin's largest five-star luxury hotel, has always held a personal history for me. As a child growing up in Ireland, I would listen to my mother telling her friends, after a trip to Dublin, what a wonderful time she and my father had at the Shelbourne. There was something in the way she articulated the word, Shelbourne, that made it appealing. I imagined her sitting in the Lord Mayor's Lounge surrounded by writers and artists, my glamorous mother perched like a movie star, smoking a cigarette and sipping sherry from sparkling Waterford. When in Dublin now, I have made it a ritual to stop by for at least for a cup of tea, and a visit to this grand old lady Shelbourne. I have seen her through some economic ups and downs and have noticed the hotel acts like a barometer for the city and, indeed, the country. On a recent visit I stayed at the hotel, glamorized with the help of 200 million Euros, and I find it more comfortable and luxurious than ever. In the center of my large room with windows overlooking lovely St. Stephen's Green was a tall bed, actually quite exceptional, adorned in 100% Egyptian cotton by Rivolta Carmignani. It looked inviting, it proved restorative, guaranteeing quick recovery from a bout of jet lag. The spacious, yet cozy, room with desk and couch, was one step up from a walk-in closet and large marble bathroom. All rooms include plasma screen televisions, high speed Internet access and individual climate control. The air in the room was fresh, completely devoid of cigarette smoke, now banned from Ireland's hotels and pubs. The famous Irish breakfast is a classic at the Shelbourne where you can either order from the menu or explore the buffet, which I recommend for its wonderful berries and fruit, just openers for the rashers, black pudding, eggs and more, all part of the traditional breakfast which takes me right through lunch into early evening excepting a chance of afternoon tea. Afternoon tea in the Lord Mayor's Lounge is another tradition in this fabulous setting. Delicate sandwiches, home-made scones, and small pastries help to relieve any midday hunger. Even the teabags are special, they arrive sheathed in fine silk. One of the special treats, not to be missed on a visit to Ireland, is Trifle. For anyone not yet initiated into this delightful dessert, Shelbourne chef Garry Hughes prepares the absolute best sherry trifle! Garry uses only local Irish ingredients and tops it off with gobs of fresh whipped cream. Irish cream, like Irish cheese, is easily the best in the world. The Saddle Room has a new award winning chef from France, Fred Cordonnier, who brings his star quality to the modern steak and seafood restaurant. Founded in 1624, a giant step in Ireland's history was created under this famous roof. On this 'enlightened' spot the Irish Free State Constitution was drafted, it was also here at the Shelbourne where literary masterpieces were written and the society of Ireland was created. Marketing executive, Aisling McDermott, kindly gave me a tour of the hotel and a memorable visit to the Constitution Suite. In the center of the room stood a long conference table, to the right of the table, protected under glass, was the first draft of a page of the handwritten Constitution created in 1922. This draft was inaugurated under the chairmanship of Michael Collins. As soon as I stepped into this room I felt myself spiral back in time, absorbing the spirit that had filled Room 112 from February to May 1922. I could only imagine the intensity of emotion that imbued those heroes who dedicated their lives to the struggle for Ireland's emancipation. George Olden, the General Manager at that time, was the first person outside the committee to receive a copy of the the Irish Free State Constitution. George Olden actually became manager in 1904, steering the hotel through the dramatic events of Easter week in 1916, when despite the fighting on St. Stephen's Green in front of the hotel, life at the hotel continued its steady course of graciously serving its guests. Fast forwarding to a calmer time in Ireland's history, we visited a suite named after Grace Kelly, where the renowned actress stayed on visits to Dublin. A painting of the star adorns a wall of the super lush and spacious accommodation. Princess Grace and Prince Rainier stayed at the Shelbourne many times and had a personal attachment to Room 270. President John Kennedy and Jackie stayed at the Shelbourne before and after his election. It was on a visit on June 27, 1963, during which he made an emotional visit to the family's old homestead in county Wexford. It was around five in the afternoon when we walked through the Horseshoe Bar happy hour at its energy peak. I saw a gathering of elegantly clad women, in the latest styles of boots and skirts with penciled eyes flashing from flawless faces, and men bristling with energy, with one eye on the women as they walked about with cell phones pressed to their ears. The crowd with whom I mingled was a flood from the offices of Dublin, and my greatest wish was to linger awhile, observing this theater and eavesdropping on their conversations. If only I could hear the theme of their chats, maybe I would understand today's priorities of the 'well-off' Dubliner. The hotel has been a part of the Dublin scene in many books written either under its roof or nearby. For example, it was here that George Moore wrote 'The Bending of the Bough” and 'A Dream in Muslin' in which he immortalized the Shelbourne. While staying at the stimulating Shelbourne, one only needs a good pair of walking shoes to explore all corners of the city. My first stop was the National Gallery of Art -- a 'must' for visitors with an Irish heritage and anyone who appreciates great works of art. The Irish collection spans works from the 14th through the 20th century encompassing Irish paintings which date from its re-emergence in the 17th century to its most important 20th century painter, Jack B. Yeats. If you have never seen a collection of Yeats work this is a real treat. Irish portrait artists Hamilton, Barry, Lavery and Orpen hang alongside a tradition of landscape artists, with a few poignant paintings depicting Ireland's famine. The Italian section is the second most numerous collection and includes Caravaggio's The Taking of Christ, a lost masterpiece discovered in Dublin. The Dutch, French, Spanish and British Schools are also well represented. Walking the streets of Dublin is far less stressing than driving, enabling an enjoyment of the aesthetic crispness and order on O'Connell St. that reflects a vibrant energy. As an Irish native, I have been bypassing Dublin to focus on more rural areas, particularly the West Coast, but now I find, in my absence, a city transformed over the past few years. Flowers line the center of the street and historic facades have been cleaned and polished. I like to visit the Post Office on O'Connell St. for the ongoing exhibit of spectacular drawings of the faces of Irish heroes who started the Easter Rising on April 24, 1918. For a better understanding of Ireland's robust history, an IMAX screen at the Trinity College Visitor's Center takes viewers back to the origins of Dublin -- its days of elegance and its days of turmoil. This is a condensed, microscopic version of the city's history, but it does put events in perspective and provides images of each period. Nobody visits Dublin without seeing one of the world's great masterpieces -- the renowned Book of Kells created from 650-800 AD. It is a inspirational glimpse into the noble and delicate sensibilities of the minds of the Irish monks who strove for perfection in their illustrations of the gospels according to Matthew, Mark, Luke and John. Grafton St., cut off from vehicular traffic, is one of the city's most exhilarating places to shop. Irish fashion has a flair for originality and garments are created from extraordinary wools and colorful fabrics. In a city always filled with life -- from early morning into the wee hours -- one senses the pace has increased. All day long a maze of people seem to be hurrying in all directions, walking with determination and purpose, as though intensely conscious of clock driven time. Dublin never sleeps, there is music everywhere, but there is always time to visit a book store or a restaurant, and Molly Malone will stand forever with her wheelbarrow at the top of Grafton Street. Dublin is vibrantly alive at any time of the year but for the holidays and new year, a stay at the Shelbourne, together with a humorous look at Irish writers during a Literary Pub Crawl, is enough to make an optimistic opening to 2009. On my second visit to Sedona’s Enchantment Resort, the smallest details of these surroundings become more visible -- all appears even lovelier than before. Arriving at the Resort, we were warmly greeted by Pat, the bellman, who, after relieving us of our luggage, gave my husband and I a quick tour of the main lodge reception area. This was our second visit in three years, and all seemed comfortably familiar. A log fire was ablaze in one cozy corner of the lodge which also houses the two restaurants and a gift shop. In this uplifting setting, with its strong spiritual connections, one always seems to pause when looking up at the red rock mountains. Only Divine architects, borrowing each warm color of an autumn leaf -- pale cream, yellow, gold, red, and ruby -- and weaving them together in wavy lines of dreamy mountain rock, could have created the panorama of Sedona. Reflections of light radiate from every canyon and crevice. These magnificent, impressionist images of soaring castles and Greek temples make Sedona an extraordinary and magnetic place to visit. Nestled in total harmony with this unique landscape is the Enchantment Resort and Mii amo Spa. All is elegant, low key, unobtrusive and refreshingly peaceful. Riding on a golf cart with Pat, as he navigated his way through the stillness of the Enchantment Resort's pine and juniper trees, we found our adobe style Casita, or 'little house.' Over the next three days we developed a genuine attachment to our little home with its fireplace, huge bathroom in native stone and scenic terrace. We spent early mornings on the terrace enjoying splendid views of the nearby red rock cliffs along with daily delivered, freshly squeezed orange juice and the morning paper. 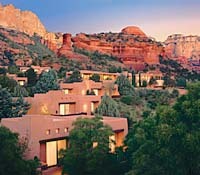 Enchantment Resort & Mii amo Spa is located near Sedona about two hours north of Phoenix. Built into 70 acres of spectacular scenery are 71 Casitas and two-bedroom Haciendas featuring southwestern furnishings, fireplaces, contemporary art, log beamed ceilings, kitchenettes and outdoor barbecues. There isn't a window in the striking Mii amo Spa where the towering cliffs of Boynton Canyon are not visible. 'Mii amo' is a Native American word meaning passage or moving forward.Completed in 1998, this destination spa within Enchantment Resort was designed to merge the magical power of its natural surroundings with the contemporary, yet organic, nature of the spa. The friendly, professional staff at Mii amo offer a variety of opportunities for those in search of a small transformation, a life enhancing experience or even a moment of clarity. Three of the most popular treatments offered are De-Stress for Life, Healthy Living and Spiritual Journey. Given a choice, I chose to be in tune with the meaning of Mii amo and take the next step on my spiritual journey. Although I don't consider myself in the 'New Age' league, I knew I was in the right environment to satisfy my curiosity. I had no idea what to expect from a Body Polish. or a Mi Amo Spirit, but since it was my second time at Mi Amo in three years, I had faith that after a couple of spa treatments I would leave feeling much better than when I arrived. After a body scrub that removes all dead cells and an ointment that looks like mud, my expert therapist, Mary, turned on the jets attached to the wall high above me. I was sprayed from head to toe by waves of steaming water. This was followed by a wonderful Swedish back massage. I knew this was a success when I found my way back to the swimming pool and just wanted to lie prone on a cushioned couch in front of the fire --- ready for a nap. My second treatment the following day was the Mi amo Spirit which includes Indian rituals. My therapist this time was Kaja. Using eagle feathers to brush away all dark spirits from the four corners of the earth, along with Indian music, I inhaled the refreshing scents of lavender and jasmine which helps in breathing and in relaxing and rebalancing of the nervous system. I learned that Aura Soma balancing is it combines the healing energies of plants, colors and crystals in order to revitalize the human aura. I am not sure how I will benefit from knowing my color is violet but I know it has always been my favorite. In our hyperactive lifestyles, with total relaxation an endangered experience, taking a journey back in time to connect with the wisdom of the American Indian may at least give us some inkling into how one hour of deep relaxation feels. This was a simple introduction into the Indian culture which seems to hold a presence in the air on walks around Enchantment. Honoring the history and legacy of Sedona’s Indian tribes; the Hopi’s, the Navajo and the Yavapai-Apache some rituals are still carried on. Several times each year the Yavapai-Apache return at sunrise to Boynton Canyon and perform their ageless sacred ceremonies adding a fascinating dimension to the character of the area. Enchantment offers opportunities for guests to enjoy Medicine walk with a tribal leader and to learn about the health values in plants and herbs. Another visit to the Spa I felt fortunate to have Divyo, a German women with insightful skills, helped me connect, through gentle talk and concentration on my Chakras (energy centers), with the joys of my childhood. She reawakened me to the strong, love-of-life person I was born to be, gently removing my anxieties and stress. (Living in Washington, DC, it can be difficult to get beyond all the negativity and war talk.) Feeling rejuvenated, even exuberant, after this session, I enjoyed the Jacuzzi, sauna and swimming pool, all in a perfectly relaxed, quiet and friendly atmosphere. Most of the time I had the facilities to myself. Men and women are separated except for the indoor and outdoor heated pools. After all this relaxation my husband and I took a walk through Boynton Canyon, its 400-foot red rock walls almost surrounding Enchantment Resort. The spectacular box canyon was long revered by the Yavapai, Apache, Navajo, Hopi and other Native Americans as a sacred place. We climbed high on mountain trails, than walked a long, rocky path getting closer and closer to the cliffs. I was thrilled when I could actually reach out and touch those red rocks, sensing that in some mysterious way I was feeling the stability and strength of the ages. Walking alongside those protective and inspiring red rocks, this is a walk you want to explore to its end. Along the dry creek bed we stopped and leaned against ancient trees with bark appearing as a mosaic of tiny tiles, their edges curling. The trees, in the serenity of their surroundings, were weathered, wise and tranquil. Above the red rock the sky was a tingling blue with dramatic slices of that blue appearing where the rock dipped into a jagged triangle. When Native Americans spoke to their gods here, they must have been inspired by one of the most serene and joyful spots the world can offer. There is much to learn about the vortexes, the energy centers within the earth, of which Sedona has more than a dozen according to Pete Saunders, author and lecturer. From Pete we learned of the outflows and inflows of these vortexes. The upflows give you a sense of exhilaration while the inflow areas offer introspection. Two of my sisters had visited Sedona previously and went into unexpected stitches of laughter when they reached the top of an upflow vortex. They remember having a joyful time, but they didn't associate it with the vortex. Sedona is well known for its spiritual energy, as well as its beauty, and I intend to continue my own exploration in future visits. The Yavapai Restaurant with its Southwestern and American cuisine is one of the top rated restaurants in Arizona. The day before Valentine’s Day the restaurant extended a warm and festive welcome: alight with candles and a single red rose on every table. The large dining area is the perfect setting for breakfast, lunch and dinner with two walls of windows overlooking Boynton Canyon’s majestic sweep. Sunday Brunch was cause for another celebration. Abundant in high quality breakfast/lunch selections, flowing champagne, and mounds of tempting petite chocolate desserts, this magnificent Brunch can turn into an entire afternoon of unadulterated hedonism. Dinner offers a four course menu which is both extensive and devoid of lavish descriptions allowing for an element of pleasant surprise for newcomers. Finding a scrumptious roasted oyster in the center of my lobster soup, was a good example of the mischievous creativity of Chef Steve Bernstein. My husband enjoyed A “Taste of the Pacific” , a colorful presentation of Sushi, including delectable seaweed. Entrees included salmon, sea bass, buffalo and lamb. The fish is flown in fresh from New Zealand. I enjoyed the flaky Sea Bass atop a mound of wonderfully flavored mashed potatoes. My husband was also pleased with his choice, saying the tender, succulent lamb was the best he has had since Ireland, which is renowned for its spring lamb. Desserts were a great success. After much pondering, I decided on the cake with the interesting name, “Warm Lemon Financial Cake with Sorbet.” It was both refreshing and delicious with just the right blend of bitter sweet. My husband, with his run amok sweet tooth, ordered the Chocolate Stash Trio, a carnival of three separate desserts equally enticing and seductive. Dim lights, together with the soft, sensual sounds of a Spanish guitarist, create an atmosphere of fun and relaxation. Service is professional. The menu at Mii amo Spa features well balanced, flavorful dishes and varies each day. Balancing lighter fare -- yogurt cereal, etc. -- is a hearty frittata soufflé, with free range turkey sausage and tomatillo salsa. Lunch, which we enjoyed outdoors in the warmth of the noonday sun, had selections ranging from grilled sea bass to sandwiches and salad. We soon became satisfied fans of the flavor-filled quality of each selection. On the last evening, I spent as much time as I could in the spa going from Jacuzzi to sauna to steam room and around again. For my last hour, I swam in the indoor pool with a roaring log fire at the lounge end, the mountains now obscured in darkness behind the glass wall leading to the outdoor pool. It was hard to part from Enchantment and Mii amo and this too brief encounter with total serenity. In the dim light I floated on my back, listening to the gentle notes of pan flute music and thinking of the power of those great red rocks and the connection with deeper spiritual realms that Native Americans experienced here. I floated back in time, allowing the water to take me to what I imagined as a gentle, peaceful, harmonious moment in the evolution of time. I almost fell asleep. Although my ear filled with water and was still blocked as the plane descended into Dulles, that moment of peace and the entire three days at Enchantment were worth gold. Sedona and the Enchantment Resort have become one of the top five places in the world I would like to return to on an annual basis. Enchantment Resort and Mii amo Spa offers a variety of packages -- all geared toward healthy lifestyles ranging from romantice weekends to insightful spa treatments to tennis lessons. The resort is a member of The Leading Hotels of the World and Small Luxury Hotels of the World groups. If relaxation, spiritual awakening and refinement interest you, check their website atwww.enchantmentresort.com. Cyprus: Anassa Hotel - Subtlety Magnificent!